What is Omacor used for? How do you use Omacor? The Omacor medication consists of capsules that are filled with oil. This oil is rich in omega 3 fatty acids. Omega 3 fatty acids reduce the fat levels in the blood and thus help to prevent cardiac diseases. Doctors prescribe Omacor when the cholesterol levels in the blood are too high. This medication is often used in combination with other cholesterol reducing drugs. Omacor may also be prescribed after a heart attack, as an adjunctive treatment. It is best to take Omacor during a meal. Swallow the capsule as a whole with some liquid. 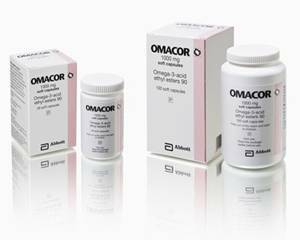 Omacor is available in packages of 28 and 100 capsules. With an elevated cholesterol level in the blood, the usual dosage is 2 capsules a day. The recommended dose after a heart attack is one capsule per day. In all cases, follow the advice of your doctor. A missed dose can still be taken, unless it is almost time for your next dose. When using Omacor you may suffer from acid indigestion. You can largely prevent this by taking the medication during a meal. Other reported side effects include: nausea, abdominal pain, diarrhea, rash, dizziness, headache, acne. Consult your doctor if you have side effects, or if you notice any side effects not mentioned in the leaflet. There is not enough known about the effects of Omacor on unborn babies and infants. The use of Omacor is therefore not recommended during pregnancy or breastfeeding. However, always follow the advice of your doctor. Omacor does not influence the ability to drive or operate machinery / equipment. Alcohol has no effect on Omacor. You are able to eat and drink anything during the use of this medication. However, keep your cholesterol-lowering diet in mind.